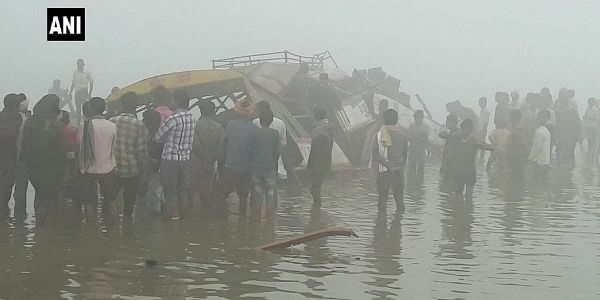 LUCKNOW: A bus driver died and four were injured when the vehicle fell in the Ken river due poor visibility as a result of heavy fog in Banda district early this morning, the police said today. The Uttar Pradesh Roadways bus, with three passengers, was on its way to Banda from Jaspura. It fell in the river from a bridge near Pailani, SP Banda Shailini said. While driver Ram Naresh died on the spot, three passengers and the bus conductor were injured, the SP said, adding the conductor has suffered serious injuries and referred to a hospital in Kanpur. Chief Minister Yogi Adityanath announced ex gratia of Rs 2 lakh for the kin of the deceased, Rs 50,000 for the seriously injured and Rs 25,000 for those with minor injuries.